Children that talk out of turn irk me, so initially it was difficult for me to get into Mourner's Bench. Told from the point of view of 8 year old Sarah Jones, it's the story of the civil rights movements' arrival in small town Maeby, Arkansas. At the center of the movement is Sarah's mother, Esther, with whom Sarah is on a first name basis. Like I said, children that talk out of turn and don't know their place aggravate me. Sarah is an old woman in an 8 year old's body. At a time when she should be outside playing and living carefree, she's more concerned with getting off of the mourner's bench at revival. Mind you, she put herself there, but she felt it was time, given who her mother was. For those not familiar with the mourner's bench, it's where people who've not yet been baptized but feel they're close to getting a sign that it's their time sit during church or revival. In some churches, it's believed that parents are responsible for their children's sins until they turn 13. Esther's big city ways keep her on church prayer lists all around Maeby. Figuring Esther has enough sins to carry, Sarah is determined to get her religion so she can become responsible for her own sins. Left behind by Esther when she went off to Chicago, Sarah lives with her grandmother, Muhdea, and great-grandmother, Granny, along with a host of young cousins left behind by their parents to be raised by their older relatives. Her close relationship with Granny is a big factor in Sarah's life. Her disrespect of her mother is in part due to her relationship with Muhdea. While neither Muhdea or Granny cottons to Esther's idea of integrating the local schools, and using Sarah to do so, it's their dismissal of Esther's opinions that lead Sarah to think she can speak to her mother any kind of way. There are enough plot twists and revelations to keep the book interesting, but there was also enough to call the story line into question. I had a hard time believing that adults would allow two 8 years to go house to house signing up black potential voters in 1960s Arkansas, especially when the threat of the local authority loomed so heavily over them. Having had grandmothers from the South, I also found it hard to believe that either of my grandmothers would have tolerated any sass that way Muhdea and Granny did, and they certainly wouldn't have encouraged me to go against my mother so blatantly. 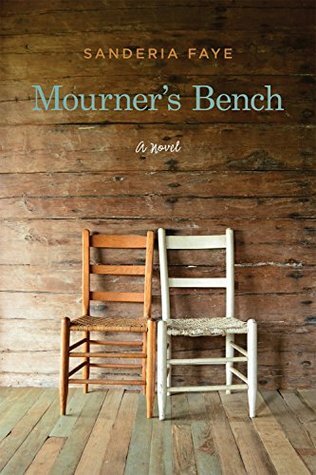 At almost 400 pages, Mourner's Bench is a decent read, but it takes far too long to get to the meat of the story. That being said, it's a decent debut novel from Faye and I'd definitely give her work another try in the future. Disclaimer: Copy of book received from publicist, opinions are my own.